Higher magnetic fields — 14 Tesla maximum vs. 9 Tesla. The Thermal Transport Option (TTO) can measure thermal conductivity, Seebeck coefficient, and other thermal properties of samples. A cryo pump will allow the sample chamber pressure to be reduced to ~0.1 mtorr (normal operating pressure is 10-20 torr of helium). 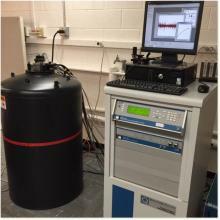 The He3 Option reduces the lower temperature limit to ~0.4 K from 1.9 K.
A helium reliquefier is integrated into the system such that it can be shut down and completely removed from the system in order to eliminate mechanical vibrations, potentially lowering the electrical noise floor for sensitive measurements. This is an inherent advantage compared with our integrated EverCool II system which can be paused, but the compressor remains running and mechanically coupled to the measurement system at all times. Current facility users who are trained on the original PPMS can begin using the new system in its current configuration with virtually no additional training. New users or anyone with questions regarding the system should contact Steve Kriske.